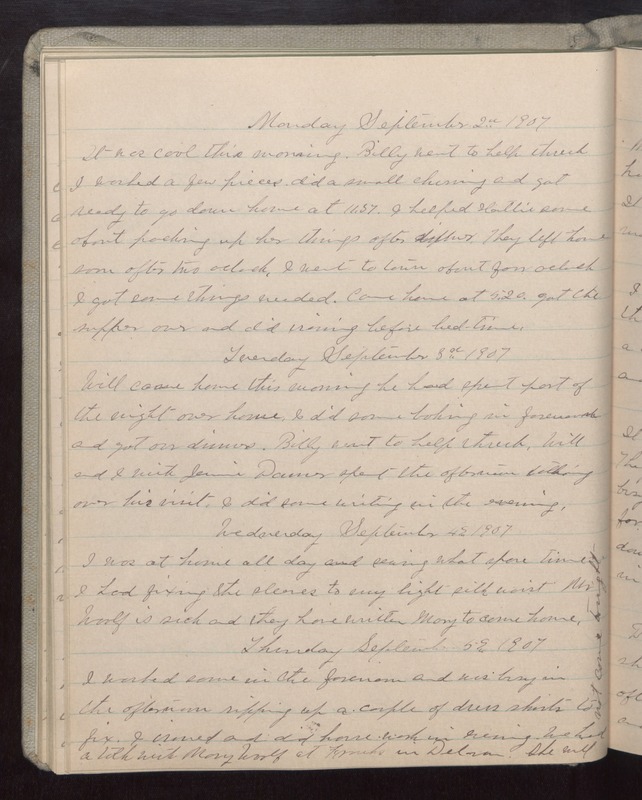 Monday September 2 1907 It was cool this morning. Billy went to help thresh. I worked a few pieces. did a small churning and got ready to go down home at 11.37. I helped Hattie some about packing up her things after dinner. They left here soon after two oclock. I went to town about four oclock I got some things needed. Came home at 5.20. Got the supper over and did ironing before bed-time. Tuesday September 3 1907 Will came home this morning he had spent part of the night over home. I did some baking in forenoon and got our dinner. Billy went to help thresh. Will and I with Jennie [Damer?] spent the afternoon talking over his visit. I did some writing in the evening. Wednesday September 4 1907 I was at home all day and sewing what spare time I had fixing the sleeves to my light silk waist Mr Woolf is sick and they have written to Mary to come home. Thursday September 5 1907 I worked some in the forenoon and was busy in the afternoon ripping up a couple of dress skirts to fix. I ironed and did house-work in evening. We had a talk with Mary Woolf at [Franks?] in Delmar. She will not come tonight.